“Enjoy it now, because you’ll miss it later,” is a refrain I hear all the time. I have two small children, a spouse, I work full-time, and I carve out time to write. My life seems full of regret. I regret the time I’m at work and not with my family. I regret not pushing harder in my career. I regret the time I spend writing. I regret when I don’t write. DD2 insists on being on my lap all the time. She’s going through a powerful “momma” phase, and while it’s super sweet, it also seriously limits my ability to stuff down around the house. If I try to slip away from her, she’ll grab my arm and pull it around her. If I leave her anyway, we have a full melt down including real tears. I can’t walk away from that no matter what anyone says. She’s my toddler. So, yes, it’s a tough time for both us, but whenever I mention it, I’m told how much I’ll miss it when it’s gone. Yes, I probably will. And, in a few months, I probably won’t remember the dishes that needed to get done, the floor that needed to be swept, or the laundry that needed to be folded. I probably won’t regret how much time I spent holding her and being there for her. But fear of regret holds me back. Have I tried for some of the toughest jobs in my field? No, because I’m afraid I’ll regret spending less time with my family, that I won’t be the spouse and mother they need. I feared I’d regret it if I didn’t dedicate myself to our family and soak up every precious moment. So when we decided to have that family, I put aside writing for years. How could I not regret taking time for writing when I only had a few hours with my spouse and daughter? 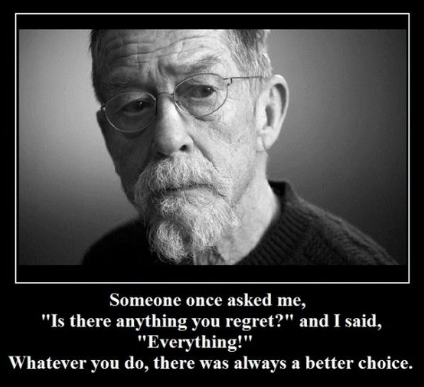 Yet, I also regret the years I didn’t spend writing. I frequently wonder where I would be and what I could be doing if I’d taken it more seriously. I’ve known I wanted to be a writer since I was a kid. It’s one of the few things that’s remained constant in my life. I want to shove regret aside. Learn to live in the moment. Learn to follow my heart (and learn to accept a messy house with two small children). How about you? Anything you don’t do because you’re afraid you’ll regret it? 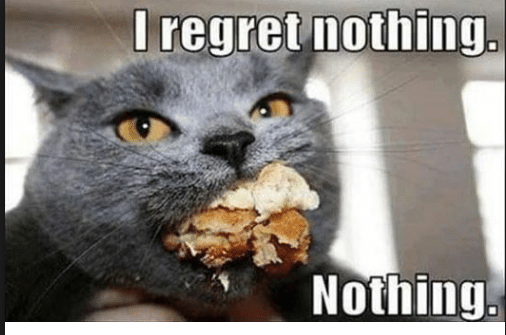 Or are you like a cat and regret nothing? Have you learned to accept a messy house? Everything is a choice. Don’t regret choosing family first. When you are my age, you will think you could have done this or that but knowing you were family focused will make the other seem insignificant. I say this having been there. My teenager was a clingy toddler, small child and even though she puts me through a tough time she still needs me near. Some days I’m on top of the house work others it drives me nuts. The same with writing and work. We writer/parents/working people have a lot going on. It’s easy to regret and doubt our choices but I choose to push on regardless, one step at a time. Sadly, I have a lot of regrets. Not taking my writing career more seriously sooner is definitely one of them for me. Yet, I am now more driven to move forward and say yet to opportunites that open up to me because of it. I also regret not jumping into indie publishing sooner. I’ve been dragging my feet, wanting to do it but being too afraid for nearly four years.